Moving overseas is a unique experience for every expat. While there are certain aspects that remain constant – the red tape, the loneliness, the financial questions – the daily details can be interpreted differently by each individual. That’s why becoming an expat is an art form. Your personal preferences and style may vary greatly from the next expat’s, but there is no right or wrong way to interpret and create your new life. 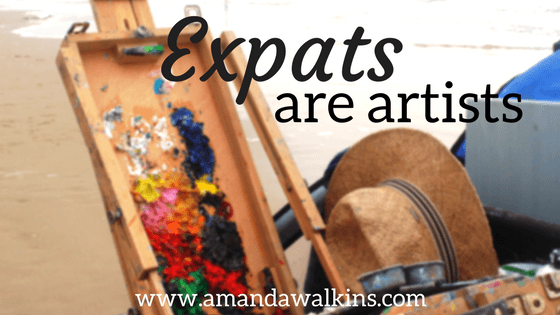 There is an artistry to becoming an expat. We all bring our own styles to these crazy experiences and we all interpret our new lives differently. Some people will portray their new lives in broad brushstrokes, making generalizations and painting a place in very few hues. Others will be more modern, challenging all the rules and creating something entirely new and maybe even bizarre. There are the Monets who appear to have a perfect new expat life from afar, but as you draw nearer you realize the details are very fuzzy. There are the Picassos who create something revolutionary and extraordinary who can influence the world. And then there are the Van Goghs who honestly just can’t handle this reality at all. Becoming an expat brings out the artist in each of us. Our true nature will always win out as we place ourselves into an unfamiliar and challenging environment. We push ourselves to creatively adapt to this new place. We experiment and push our boundaries and learn from others along the way. You can’t be an expat in Roatan and not learn to scuba dive! And whenever we decide we’re finished with our new piece of art and we settle into a new life, we then have new decisions to make. We might opt to sell this new tapestry to others – showing off a life well lived and encouraging and inspiring others to enjoy it, too. Or we might just hang our hats on it and enjoy looking at it every day. We might sit back to admire our work only to decide that it’s horrible and should be destroyed. And, for some of us, the work is never complete. There’s still missing something, some je ne sais quoi. We will search for it somewhere new until it finally falls into place…and then we’ll start all over again! Artists are strange people. So are serial expats. Hi, I’m Amanda and I’m a Serial Expat! I am an admitted serial expat. I get unstoppably itchy feet around two years into a location – whether a particular home or a city or a country. Sometimes it doesn’t even take that long. Six months is a common point at which I wonder where else I could explore. I feel the need for change and adventure and new challenges. I wonder what else could be waiting just around the corner. I find myself daydreaming and researching flights to whatever airport code pops up next. Which is probably why I frequently find myself saying, “For now” in response to questions about where I live. I know that my answer could change again very soon. But the key to this type of existence is knowing the difference between running away from something and running toward something. If you’re running away, you are likely to have to keep running. No new place will hide you for long enough from whatever it is you’re running from. Most likely, you’re just trying to run away from yourself. Sorry to burst your bubble, but no number of beers, sunsets, or flights can keep you hidden away from yourself for too long. You have to find your own happiness apart from your physical location before you can feel happy wherever you might land. On the flip side of that, you can run toward something. Run toward new opportunities and challenges. Run toward a different climate or the sea or a new culture. You can run toward what you want without having to run away from yourself. Me? I keep running toward something, searching for that perfect blend of color and texture to make me feel like my own piece of art is complete. So I’ll keep saying where we live “for now” and proudly being the work-in-progress that I am. Fellow expats, I hope you’re painting something beautiful that makes you proud! We’ve been expats in multiple countries, including Honduras, Scotland, and Ireland. For now (see what I did there? ), we are living on the Mediterranean island of Malta. You can follow our adventures by subscribing to my newsletter below, and follow me on social media, too! I’m on Facebook, Instagram, Twitter, and Pinterest.